This is a fabulous product when you need to exfoliate and moisturize. Exfoliating stimulates new skin, while the oils penetrate and feed the skin. Put a small amount of scrub on your fingertips, gently rub together to soften the hard edges of the crystals. Then apply to skin. Rinse well and pat dry. We only make our scrubs with essential oils, because this product aids in detoxifying our skin as well. 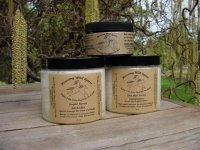 A note on the difference between the salt and sugar scrubs below: Salt has larger, harder crystals. Sugar will not be as astringent, and the crystals are smaller and break down faster. Available in 4oz and 16oz sizes.